The popular endless runner has been updated with a new icy world featuring ice luge sections. Imangi Studios has announced the release of a new content expansion in its popular endless runner, Temple Run 2. Called Frozen Shadows, the expansion sees Guy Dangerous and Scarlett Fox travel to an icy world where they’re challenged to run away from a new Demon Monkey. In the Frozen Shadows expansion, the general gameplay remains from the base game, as players must help their runner avoid obstacles as they attempt to survive as long as possible. 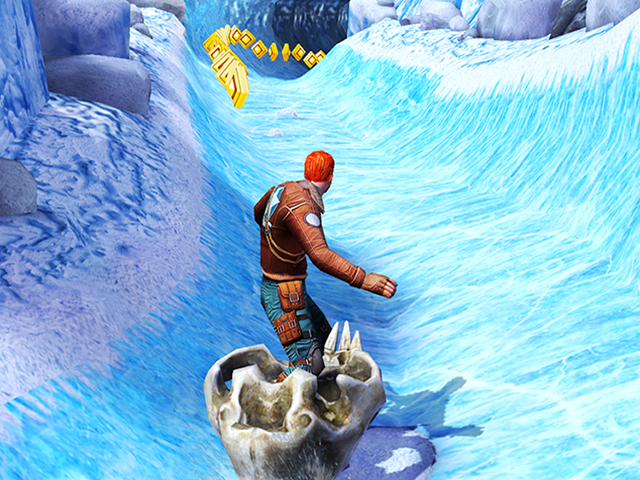 However, this frozen world also includes new ice luge sections, which see players tilt their device to ‘skate’ along icy paths while riding a large Demon Monkey skull. These ice luge sections include obstacles players can avoid by jumping over them or sliding under them, as examples. This update includes new artifacts, as well as new winter costumes for characters. Finally, players can perform new stunts while jumping and sliding. This is the first in a series of world expansions we have planned for Temple Run 2 over the next year. Frozen Shadows gives Temple Run 2 fans an entirely new terrain to explore, and a new twist on the gameplay with the ice luge. It’s basically a completely new Temple Run game in an update. This new version of Temple Run 2 is available to download for free on the iTunes App Store, Google Play and the Amazon Appstore.